March 30, 2010 In News What is Michelle doing now? Michelle attended the Internet Corporation for Assigned Names and Numbers (ICANN) 37th Public Meeting in Nairobi and concentrated on photographing the public speakers, as well as undertaking a photography assignment for the ICANN Business Constituency. This is the organization which has overall responsibility for the coordination of the Internet’s domain name and IP address space. To protect this space, ICANN operates on a multi-stakeholder, bottom-up consensus-building policy-making arena. Michelle particularly enjoyed photographing the speakers, capturing individuals as they conversed with the audience on topics about which they themselves are experts. Images capturing the sharing of information in this fast-moving technological world. ICANN images can be viewed here. The Norfolk is a truly legendary hotel. 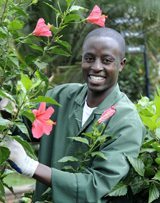 Founded in 1904, it has provided an oasis for travellers in Nairobi for over 100 years. The open-air Lord Delamere Terrace serves food and cocktails all day, from sunrise to sunset. The hotel is frequented by dignitaries and celebrities, with the fragrant tropical gardens offering a welcome sanctuary from the hustle and bustle of this buoyant city. 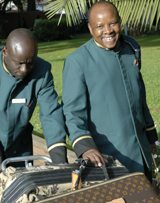 One of the outstanding features of this establishment is that everyone, from the bell boy to the barman, offers service with a genuine smile, and takes obvious pride in working in one of the most famous hotels in the world. Refreshing cocktails served with a smile at the Cin Cin bar. 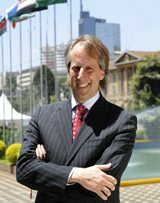 Whilst in Nairobi, Michelle was commissioned to shoot images of Rod Becksrom, CEO of ICANN, for CIO EAST AFRICA. This is the leading magazine for the Information and Communications Technology (ICT) industry in East Africa, published by the African eDevelopment Resource Centre in conjunction with the International Data Group (IDG). After a conference in Nairobi, the contrast of visiting a Masai homestead was a privilege indeed. With the help of local photographer David Namu, a trip to a Masai homestead was arranged. 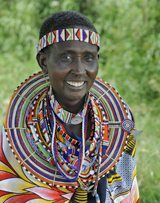 The Masai are a semi-nomadic people who live in Kenya and northern Tanzania. Easily recognisable by their traditional red robes and intricate jewellery, they lead a pastoral lifestyle where a man`s wealth is measured by two factors: how many cattle he owns (known as “head of cattle”), and how many children he has fathered. 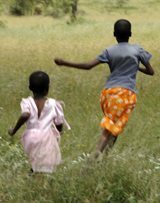 Michelle was overwhelmed by the Masai’s willingness to share what little they have, the children playing happily with simple sticks and stones, and by their total affinity with nature. Gifts of brown sugar and tea leaves, as well as a donation towards a purchase of cement, were all gratefully received. The Masai are indeed a proud and self-composed people who respect, and are totally at one with, nature. A selection of images can be viewed here. "Born Free", children at one with nature.